The late delivery of another new expedition ship has been confirmed. The 176-passenger World Explorer, expected from Portugal’s WestSea Viana Shipyard this month, is now due to be delivered in summer 2019 instead of later this year. She was floated on October 28. 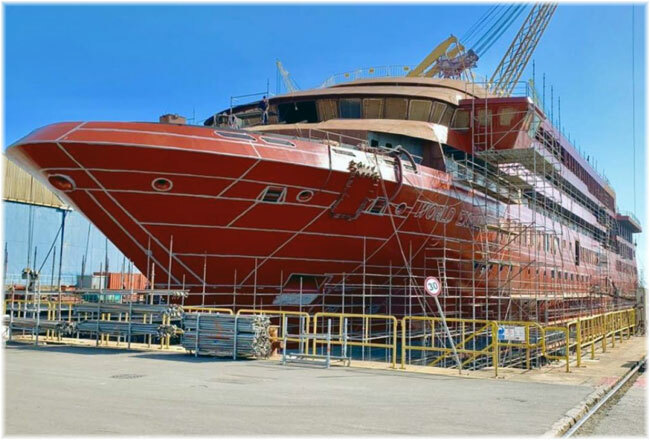 The 9,300-ton ship, being built for Portugal’s Mystic Cruises, had been schedules to go on charter to Quark Expeditions for the 2018-19 Antarctica season and then be delivered to Mystic’s German subsidiary Nicko Cruises in the spring. The delay is understood to be to allow time for the yard to install a sophisticated hybrid power management system that will provide environmental and energy-saving benefits. After losing her 2018-19 Antartctica season, Quark customers booked on the World Explorer were given a generous credit to use for a future voyage or offered a full refund. Quark will charter the World Explorer for the 2019-20 Antarctica season. 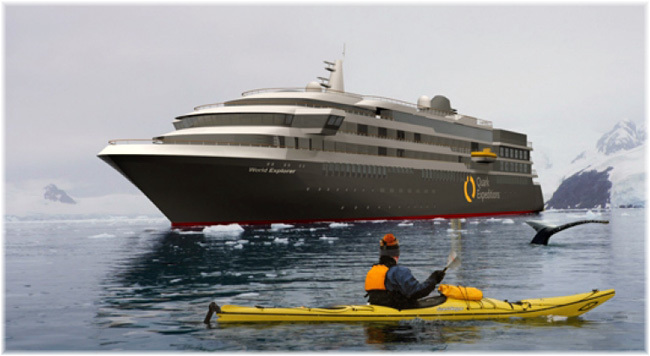 In addition, Quark is building its own 200-berth expedition ship at Croatia’s Brodosplit shipyard. Delivery is set for third quarter 2020, in time for the 2020-21 Antarctica season. The World Explorer is the first in a planned series of up to ten expedition ships for Mystic Cruises, which it intends to operate for various charterers. Mystic owner Mário Ferreira is expanding into ocean cruising after building up the Douro River market in Portugal, where his DouroAzul is the largest operator with an expected twenty vessels in operation by 2019 for many individual river operators. P&O Cruises’ 1,818-berth Oriana will leave the fleet next summer. The 1995-built ship will head for a new Chinese brand, part of the China Travel Services (CTS) conglomerate. The venture also includes a partnership with China Ocean Shipping Group (COSCO). Oriana’s new owner, Oriental Fleet Cruise 01 Ltd, is part of a joint venture between CTS and COSCO, which recently purchased the 1995-built vessel from P&O Cruises. She was registered in the Marsahall Islands in June and will leave P&O Cruises next August. She is now operating on bareboat charter to P&O. V.Ships Leisure has been awarded the contract to handle both technical and hotel operation management. The vessel will start operating cruises from China around mid-September 2019. 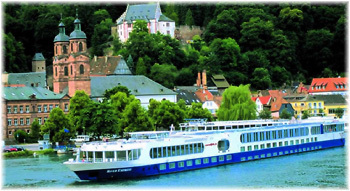 Cruise plans have the vessel sailing short cruises from Chinese homeports to Japan, Vietnam, the Philippines, Malaysia, Thailand, Singapore, Brunei and Indonesia. To support this project in its entry and expansion into the Chinese cruise industry, V.Group will set up a new office in China, making it the first ship manager to set up an office in China for large-scale cruise operations. Virgin Voyages’ recent announcement of a fourth “Lady Ship,” a name chosen to stress the line’s British heritage, revives memories of an earlier set of “Lady Ships” that traded the same waters of the Caribbean between 1928 and 1952. Canadian National Steamships operated the five passenger cargo liners that composed the first set of “Lady Ships.” They were built by Cammell Laird in Birkenhead and were also British-themed, being named for the wives of famous British Admirals. 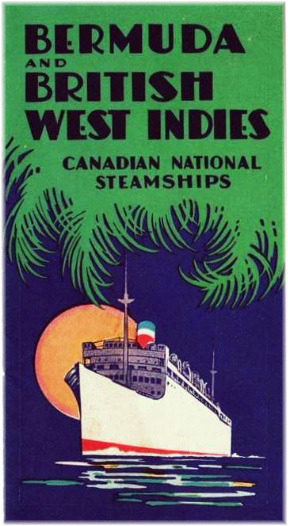 Canadian National’s eastern route ran down through the Leeward and Windward Islands to Trinidad and British Guiana, and returned by way of Jamaica, Nassau and Havana. 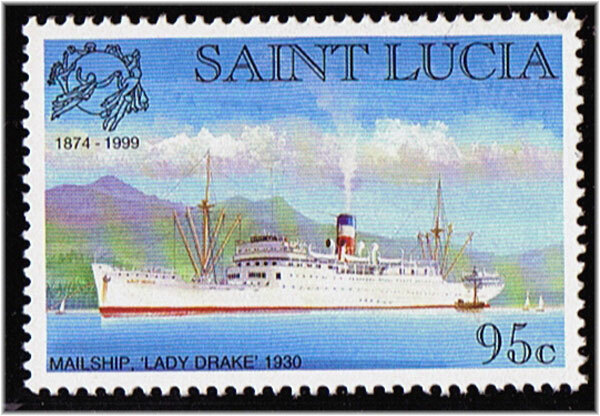 Operating the eastern route were the Lady Drake, Lady Hawkins and Lady Nelson, each of about 7,895 tons and completed in 1928. This trio were registered in Halifax, Nova Scotia, offering year-round fortnightly sailings from Halifax to Bermuda and the Eastern Caribbean islands as far as mainland Demerara. The 35-day round voyage returned to Saint John, New Brunswick to discharge sugar before returning to Halifax to load once more and embark new passengers. The 1929-built 8,194-ton Lady Rodney and Lady Somers, on the other hand, were registered in Montreal. These ships left Montreal on alternate Wednesdays on the western route via Bermuda, Nassau and Kingston, Jamaica, during the season of navigation in the St Lawrence. Fares for the full 25-day round voyage started at $180. Northbound they could load up to 100,000 bunches of bananas. All five “Lady Ships” sailed from Halifax by winter, also making a call at Boston, which was introduced on 1930 in both directions. Round voyage cruises were variously offered from Montreal, Halifax and Boston. The Canadian “Lady Ships” carried about 130 first-class passengers. But the three eastern route vessels also had accommodation for 32 second class and 102 deck passengers for inter-island trade, while the western route ships were fitted to carry bananas. The Lady Somers became known for carrying the Duke and Duchess of Windsor to Nassau in August of 1940, when he arrived to take up his wartime post as Governor of the Bahamas.